My family and I love the beach but when we are not traveling we don’t go much. Guatemala’s beaches aren’t the best when traveling with kids. They are more of a party place. However, we found a beach rental that offers all I could ever wish from one. We had one of the best weekends at a beach that we have had in a long time. My family and I love beaches and when we are not traveling, we like to still visit the ones in Guatemala. However, they are not well developed with touristic infrastructure and are mainly used by locals as a party area. Plus I travel with my sons so we can’t just stay anywhere. So I decided to start looking for a vacation rental but finding the right one for us wasn’t easy. – Private pool – My sons love swimming pools and staying in the comfort of your own home while the kids have a blast is what I call paradise. – Has right to the beach – That is in the point of a beach house right? – Full kitchen – I hate cooking but it’s good to have everything you need for a quick and simple meal for the kids and so much cheaper than eating out. – Comfy living room and TV – I barely ever watch TV at home so a movie night with my family is the second part of paradise. – Comfy beds – Enough beds so my boys don’t have to share one. So these were the things I was looking for when searching for a rental. However, during my search, I kept finding houses that were too expensive, far from the beach, on some busy and dirty beach or in the middle of all of the loud bars and parties. After hours of research I found Casas Pelicanos Monterrico and immediately knew this was the place for us. 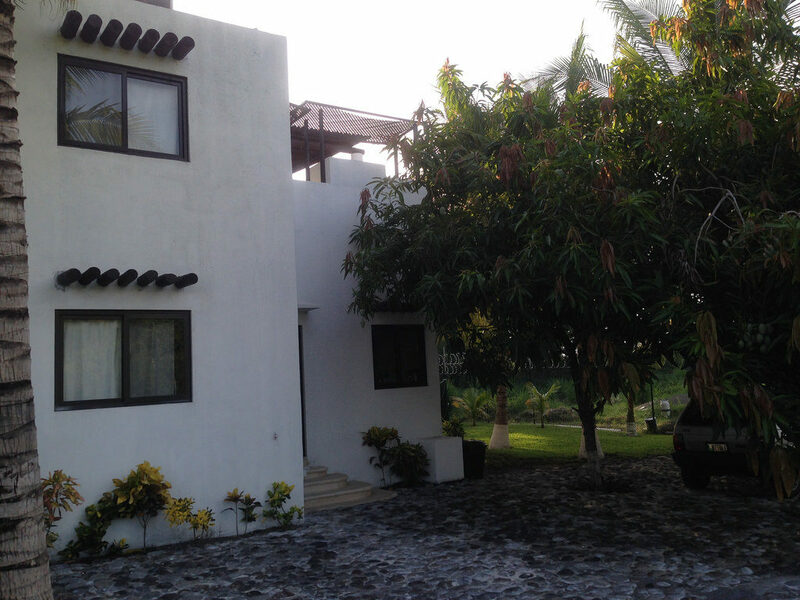 Casas Pelicanos Monterrico are basically equipped rental beach houses. Each of them has a private pool, lounge, BBQ grill and porch with hammocks. Some of them are large enough to fit groups of up to 24 people. When I first heard that, I couldn’t believe you could fit 24 people on one of those homes but seeing is believing. Now that I have seen them, I am sure that you could fit such a large group and not be crowded. I ended up picking the house meant to fit up to 12 people. Because we were only four people, we didn’t get to use all of the rooms. I loved how the house was set up in a way where two large families could stay without ever invading on one another’s privacy. All of the houses have AC. This as a big deal for me because 90% of hotels in the country don’t offer air conditioning and at the beach, this is a necessity. Another benefit that they offer that I haven’t seen anywhere else in Guatemala is a babysitter service. The whole point of the trip was having family time so we didn’t use the service, but it is nice to know that they offer it in case we wanted to go out for a date night. Plus it is only $15 for the night. The houses are fully equipped so there is no restaurant. But they do offer a personal chef service for an extremely affordable price. If you request, they can even have some ceviche ready when you arrive. I definitely took advantage of that service. It was the best ceviche I have ever eaten. I can actually say this with authority because we have eaten ceviche in numerous places. My husband is a huge fan of it. 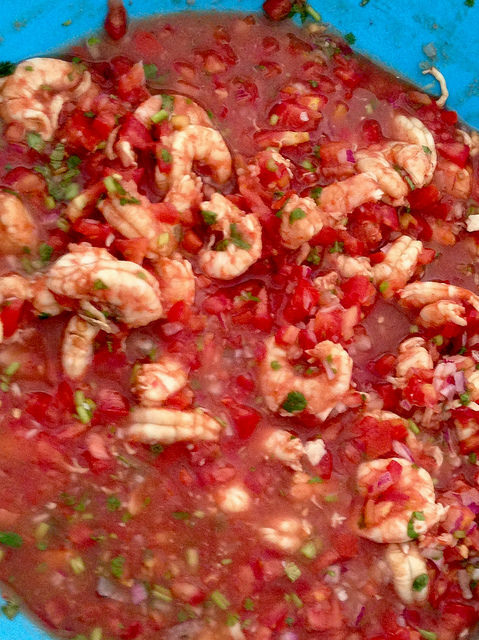 This homemade, fresh shrimp ceviche fed all of us for lunch and dinner the first day. For the following day we had our own chef come to make us lunch. 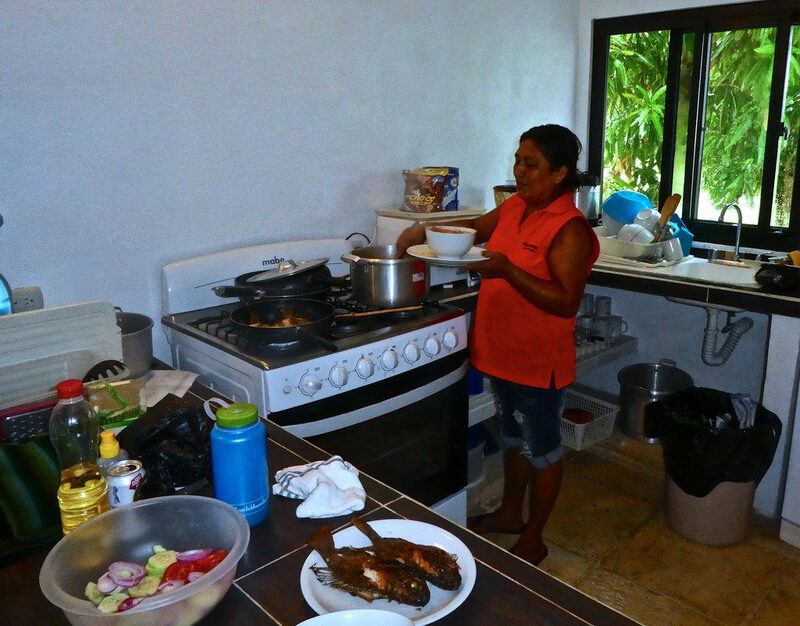 She is a local woman who specialized in local cuisine, which is mainly seafood. She came over while we were chilling at the pool and cooked up a delicious meal. We asked for seafood soup and freshly caught fried fish with rice and salad. There was enough food to feed everyone in every house there. It was delicious. We didn’t need to buy any more food for the rest of the weekend. The best part is that everything, including the chef and fresh ingredients, was $45! 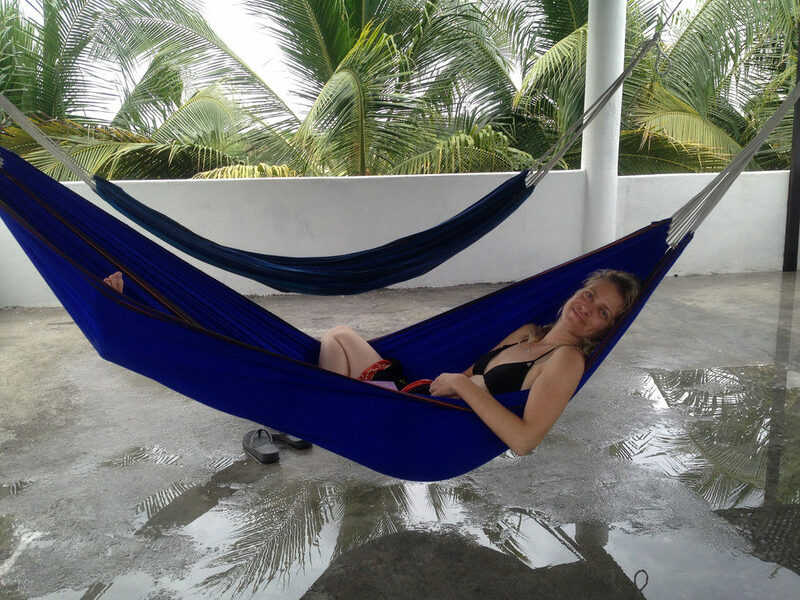 The beach houses are about twenty minutes from Monterrico, the main beach town of the area. Near enough if you want to go buy some stuff but far enough that you feel like you were in a private beach. We only left the place once. The place was such a gem that made us feel 100% comfortable. Plus there was a small supermarket where we bought some snacks and drinks and that was all we needed. We went back to the house and stayed there enjoying some relaxation. Another thing that I liked was the fact that all the houses were full that weekend, but you never heard the neighbors. The only time we saw some of the others was at the beach where they swimming and enjoying the perfect night as we did. The last day we were at the house it rained all day. This ended up being a blessing, because we still had warm weather but it wasn’t too hot, perfect for hanging out by the pool. It was perfection! My sons swam all day long while I enjoyed the roofed lounge area. You should also keep in mind that there is no internet here. For me, it was the perfect excuse to disconnect. My kids were loving all of the attention I was giving them. I am so glad I found this paradise escape. 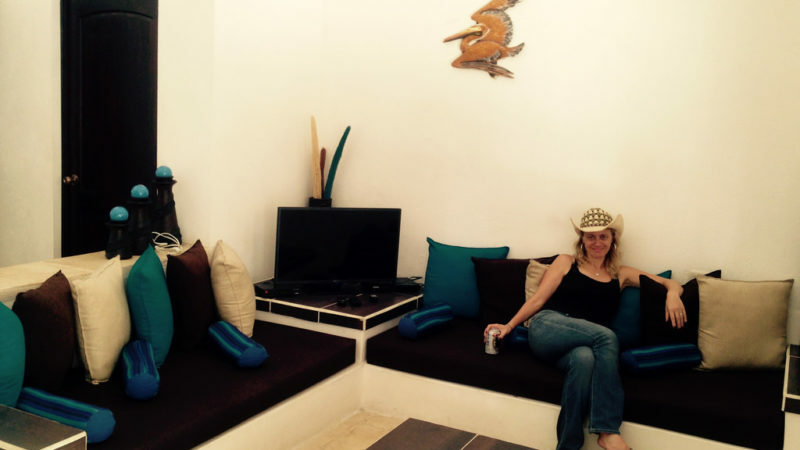 We are definitely making it our go-to beach house in Guatemala. There is nothing else I would want in a beach rental. This sounds absolutely amazing! I love Guatemala and have heard that the Monterrico area is beautiful, but I’ve never been. Thanks for sharing–it can be so hard to know what you’re getting into with house rentals. Will definitely be saving this for the next time I go to Guat!